Cook chicken in water and 1 tsp. salt until done. Remove chicken from broth, cool and cube (about the size of Yahtzee dice :-). When cooled, put chicken into a large mixing bowl. 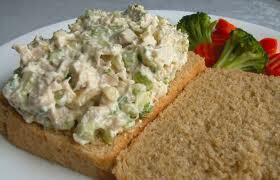 Add the diced celery, slivered almonds, mayonnaise, whipping cream and lemon juice. Salt and pepper to taste. Refrigerate for one hour before serving.